This collection of mixed-up fairy tales begins with the premise of a mother reading to a child at bedtime. "Kiss? Yes./Water? Yes./Bedtime? NOOOO!" While the text is rather slight, the retro illustrations reminiscent of the 60's carry the story forward, and make the most of some of the ridiculous juxtapositions. For example, in the story of the Three Little Pigs, sticks, straw and bricks are followed by, "Solar panels? NOOOOO!" and the next page concedes, "Well, maybe," as readers are treated to a double-page spread depicting hippie pigs hanging solar panels on their brick townhouse next to a community garden where a folk music concert is taking place. Sharp-eyed readers will spot the first of many visual jokes: a wolf strolling by, handing out flyers promoting wind power. The addition of shampoo to Little Red Riding Hood's story turns her grandmother into a manicurist at a beauty salon, and Red gets her nails done, as the woodsman expertly shampoos the wolf's mane. What really makes this book fun to read are all of the little details filled with sly humor. The salon contains baskets of sale items, including "Den Head" fur wax, and a copy of "WQ" magazine (Wolf's Quarterly, no doubt) for waiting patrons to read. The addition of a disco ball to Cinderella's story ends up with Cinderella shimmying in a silver jumpsuit and platform heels with a suspiciously John-Travolta-esque Prince Charming, as a bellbottomed Fairy Godmother looks on and giggles. The recurring refrain of, "Well, maybe," finally comes in to play at the end of the book as the mother and child say, "Kiss? Yes./Water? Yes./Bedtime? Well, maybe," leaving the child snuggled soundly into bed. This book would be great for sharing one-on-one. For ages 4-7. 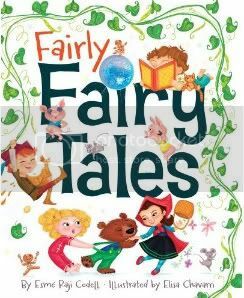 Thank you for the great review of Fairly Fairy Tales!! Thanks for commenting! The art was the best part! All those humorous little details made it really, really fun.